Well, we’ve come to the end of another year and in this fourth edition of Digital Oman (DO) we talk to BankMuscat’s Wahid Panwala about the newly-launched smart basmaRewards loyalty card; Raza Ashraf looks at business continuity planning and how to avoid disasters; Ian Sharpe talks handheld entertainment; we’ve life caching with mobiles and blogs; an analysis of technology’s impact on sport; e-adoption in the health sector; Graham Smith walks us through smartphones; Salim Al Isamaily of ITTS tells us about digital convergence and where Oman’s IT sector could be heading in 2006. Plus news, readers’ letters and a whole lot more! We believe DO’s remit is to analyze information communication technology (ICT) that has the potential to transform lives, business, industry and government both in Oman and across the world. As well as providing in-depth coverage of domestic and international innovations as they move from pilot projects to the marketplace, DO evaluates the social impact of technologies in a variety of fields - from government, education, telecommunications, finance, manufacturing, sport to retail. It is our belief that DO has the power to arouse interest in ICT and provide information that is not readily available. Indeed, in these days of information overload people need trusted influences to guide them through the mass of information. In this regard, DO is already perceived as a reliable and intelligent ‘friend’ that passes on ICT recommendations - issues to think about, explore, do or buy. In fact, DO has been designed specifically to be part of an individual’s personal network of reliable ICT sources. Gaming; e-Health; Open Source; Data Warehousing; Banking and Technology; the Net and Economic Growth; Sport and ICT; Telcos and How life in a connected world will be different; Youth and e-Literacy; and e-Government. So, there’s plenty to look out for in the New Year. On the domestic ICT publishing front, DO has a head start in responding to this rapidly evolving post-mass-media world. Provided the magazine continues to give readers good reasons to engage with it, and knows how to harness that engagement, DO has a bright, long-term future. 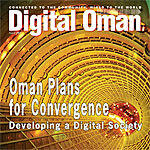 And of course, on behalf of all of us here at Digital Oman, our best wishes for a happy, healthy and e-profitable 2006!